Last December OSC’s Diploma Program students once gain explored the Peak Wilderness area and made a pilgrimage to the summit Sri Lanka’s sacred mountain, Sri Pada (Adam’s Peak). The idea behind this annual field study is to better understand the mountain’s ecology and appreciate its value as a stronghold of biodiversity in a rich Sri Lankan cultural landscape. As this blog has recorded the experience started out as an Environmental Systems and Societies (ES&S) field study but it now incorporates the three major DP1 science classes. This year the DP Physics students, led by HOD Will Duncan, accompanied us part way and then stayed at a guest house near Maskeliya Lake. They focused on themes of power generation and were able to visit a CEB hydroelectric turbine and later use natural stream flow to test electricity generating devises built by the students. They were supported by Dr. Indrika Senaratna. Tim Getter, the DP Biology teacher and I with the support of colleagues Dawn McCusker and Taiga Shipley took our students deeper into the wilderness to conduct our learning activities at the Fishing Hut. 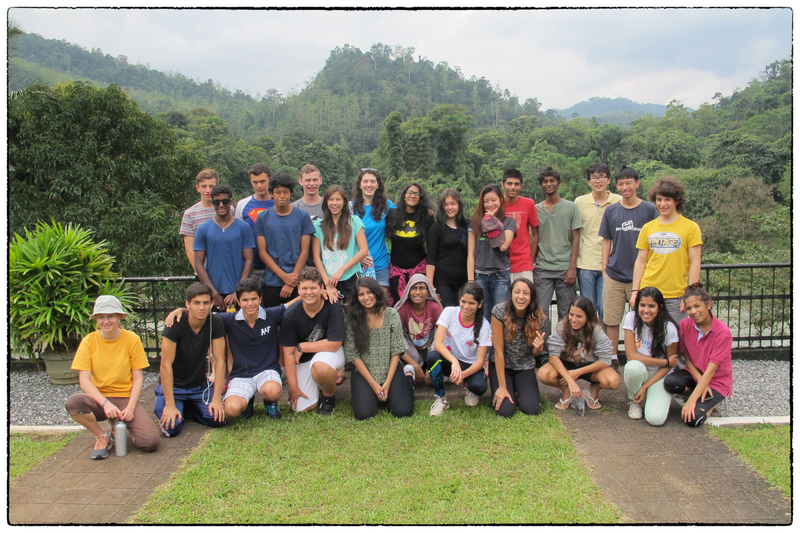 OSC’s Class of 2016 taking a breakfast break at Kitulgala on the way up to Sri Pada. 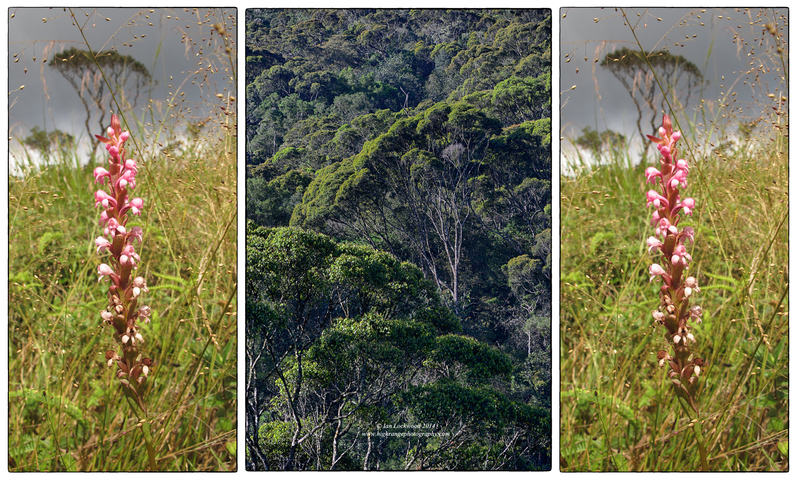 Ground orchid (Satyrium nepalense) in grasslands in a collage with montane forest canopy view. Our principal study day was on Tuesday December 9th when the ES&S class ascended the peak and the biology class conducted a series of ecological studies around the fishing hut. The ES&S class went with light packs for the day. The idea was to observe and record changes in plant diversity as we traversed human and natural landscapes and gained altitude on the peak. The hike is physically demanding, but it is a beautiful, wooded trail that is hardly use by pilgrims. Large clouds gathered over us by midday and we navigated several rain showers on the final step section just below the peak. We arrived at the temple around 1:00. It was wet and so, after ringing the newly installed temple bells, we started back down the hill. Originally we had intended to stay on the summit but several students were not outfitted with sleeping bags and warm gear, which necessitated a return to the hut. 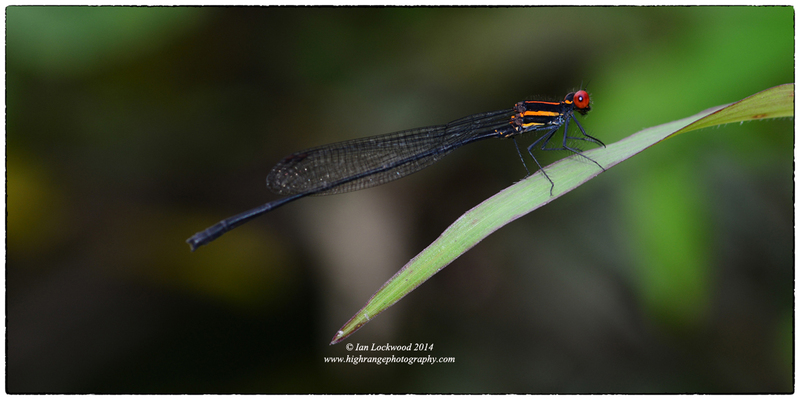 Red Stiped Threadtail (Elattoneura tenax), an endemic damselfly, in a stream emerging from a mixed plantation of eucalyptus and degraded montane forest. On the final morning the ES&S class left the hut early in order to study stream diversity and look for dragonflies in degraded forests. The biologists completed a biotic index study of two streams and by mid-morning all our groups were heading back to Colombo. There was heavy traffic that delayed our arrival back at school. In spite of itchy leech bites and sore legs it was a memorable learning experience of applied science in a unique part of our Sri Lankan host nation. 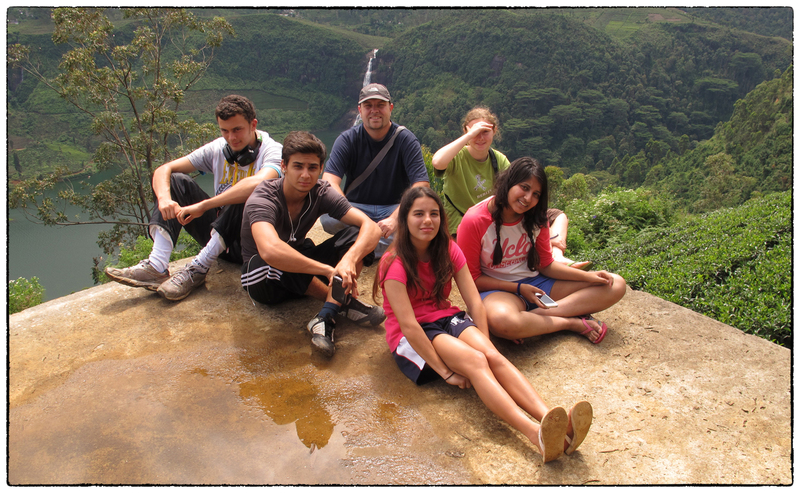 OSC’s DP ES&S class and their teacher at the Adam’s Peak Falls viewpoint. Aksland, Markus. The Sacred Footprint: A Cultural History of Adam’s Peak. Bangkok: Orchid Press, 2001. Print. Carpenter, Edward. From Adam’s Peak to Elephanta. London, 1910. Print. Cowley, Les. “Mountain Shadow Effect.” Atmospheric Optics. 14 October 2006. Web. also see Sri Pada shadow. Dhammika, S. “Sri Pada: Buddhism’s Most Sacred Mountain.” Sacred Island: A Buddhist Pilgrim’s Guide to Sri Lanka. Web. Iyer, Pico. “The Holy Mountain.” Time Asia. August 8-14, 2006. Print. Living Heritage Network. Sri Pada. 10 October 2006. Web. Lockwood, Ian. “2013 OSC Field Study to Sri Pada.” Ian Lockwood Blog. January 2014. Web. Lockwood, Ian. Primal Peak.” Outlook Traveller. March 2007. Print & PDF. Lockwood, Ian. “Sri Pada: A Naturalist’s Pilgrimage.” Serendib. Print & PDF. Skeen, William. 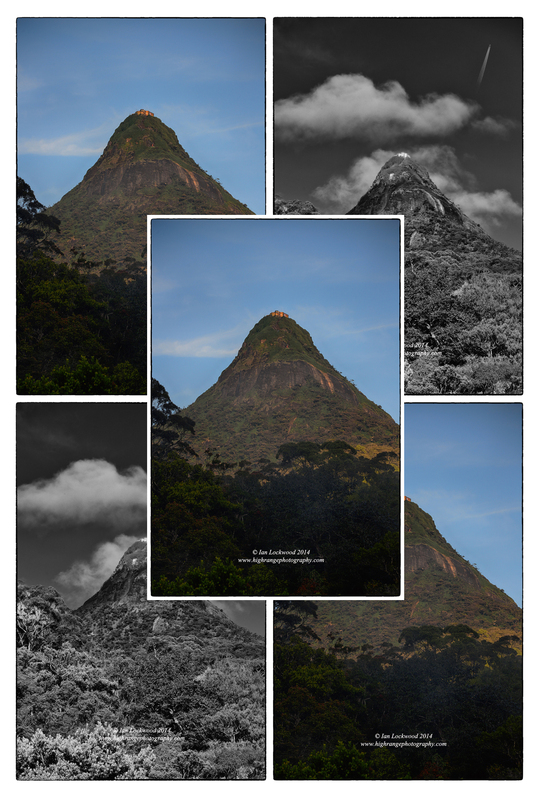 Adam’s Peak: Legendary Traditional and Historical Notices. Colombo: W.L.H Skeen & Co. 1870. Print. Tennent, James Emerson. Ceylon: An Account of the Islands Physical, Historical and Topographical, 2nd Edition. London: Longman, 1859. Print.